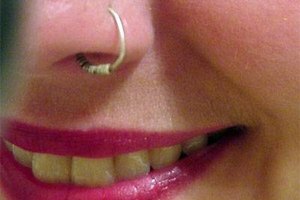 A nose screw is a type of body jewelry used in a nose piercing. The piece gets its name from its corkscrew shape. When you have your nose pierced and one of these items put in, the person doing the piercing will actually twist the screw around as it goes in to manipulate it into place. If you decide to get rid of your nose piercing or change the jewelry, you’ll first need to remove the nose screw. This can be done by twisting and manipulating the metal back out of your nose. Wash your hands as carefully as possible, using antibacterial soap and water. You can easily transfer bacteria from your hands to your piercing if you try to remove it without thoroughly washing and cleaning your hands. Place a small amount of lubricant on the outside and inside of your nose, making sure to cover all areas of the metal. Experts recommend KY jelly, because it washes off easily. This helps the jewelry slide out, and prevents it from getting caught inside your nose. Push a cotton swab into your nose and find the inside edge of the nose screw. Give the screw a light push with the cotton swab. This should make the screw start sliding out of your nose. Alternatively you can use your finger to push the screw out (if your fingers are small enough). Watch for the nose screw to start moving to one side. This signifies that the nose screw is coming out. Since it has a slanted or angled side, it won’t come out perfectly straight, but will slide out at a slight angle as the different sides push through. Twist and turn the nose screw with your cotton swab (or finger) to push it through your nose. If it seems to catch on your skin, tilt your cotton swab to help angle it out. Then you can pull the rest of it out in one fluid motion. Wait at least 6 to 8 weeks after getting your nose pierced before you try to remove your nose screw. 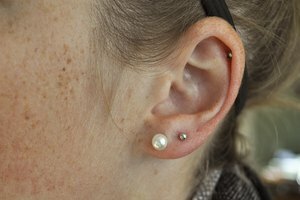 This is the amount of time it takes your body to heal from the piercing, according to professionals.